We’ve heard mixed reviews on cooking salmon sous vide, but stubborn salmon lovers we are, we were determined to try it, anyway. We did quite a bit of research before diving in and learned a few things — the most important being that brining the salmon before precision cooking it is the key to success. Another thing that really surprised us was that different types of salmon yielded quite different results. We tested wild Coho salmon, as well as Norwegian salmon. Both worked very well in the sous vide, but the results were definitely distinct. The Coho was firmer and easier to handle when searing. The Norwegian fillet, though requiring more delicate handling, was more supple and wonderfully salmony. Both were delicious, and because they were both brined for 30 minutes before they went into the sous vide, they didn’t require any additional seasoning. Keep reading for the perfect sous vide salmon, as well as recipes for Lemon-Dill Creme Fraiche and Chilled Cucumber Salad to go with it. Notes: Brining is an important step in preparing salmon sous vide. The brine keeps the albumen (white bubbly stuff) from leaching out of the salmon, as well as seasons the fish throughout and provides another defense against overcooking. If crispy salmon skin isn’t your thing, you can remove the skin before cooking or after and serve straight from the water. Alternatively, you can take the bags directly from the water and chill in a water-ice bath. Once the fillets have chilled, you can serve chilled or store in the refrigerator for up to 2 days. 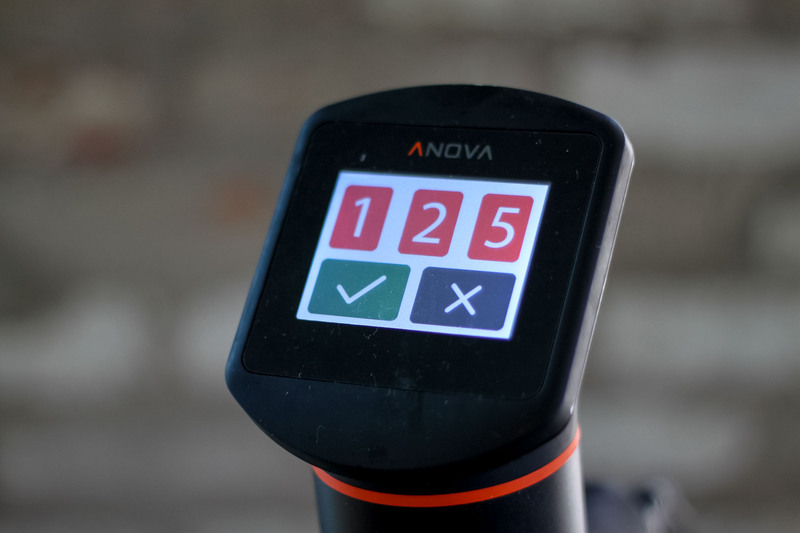 Set the Anova Sous Vide Precision Cooker to 125ºF (52ºC) for medium-rare or 135ºF (57ºC) for medium. For the brine, whisk 1/4 cup kosher salt into the ice water until dissolved. Add the salmon and refrigerate for 30 minutes, or up to one hour. Remove the salmon fillets from the brine and rinse with cold water. Pat dry and place each filet in a separate zipper lock or vacuum seal bag with 2 tablespoons of olive oil. Seal the bags using the water immersion technique or a vacuum sealer on the moist setting. Place in the water bath and set the timer for 20 minutes, or up to 50 minutes. Meanwhile, prepare the lemon-dill creme fraiche: In a medium bowl, stir together the creme fraiche, dill, lemon zest, and lemon juice. Season to taste with salt and pepper. Prepare the cucumber salad: In a second medium bowl, combine the cucumber, red onion, red wine vinegar, and 1 tablespoon olive oil. Season to taste with salt and pepper. When the timer goes off, remove the bags from the water bath. Carefully remove the salmon and pat very dry with paper towels. Heat remaining 1 tablespoon olive oil in a large nonstick skillet over medium-high heat. Add the salmon skin-side down and sear until skin is crisp, about 1 minute. Transfer to a plate. Serve with lemon-dill creme fraiche and cucumber salad.